PalmOne has formally launched its Treo 650 in the UK – more than six months after jammy Americans got their mitts on the keenly anticipated smartphone. We’re not quite sure what ‘formally launched’ means, because there’s still no UK telecom networks offering them and you can’t officially buy them anywhere. 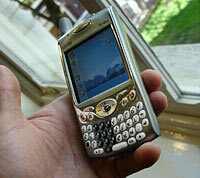 It’s all rather frustrating because the presentation had thoroughly whetted our appetite for the Treo. The updated version of the hugely successful Treo 600 offers a higher-resolution 320×320, 65,000-colour screen, a removable battery, 312MHz Intel XScale PXA270 processor, 32MB of Flash memory (21MB available to the user), Palm OS 5.4 ‘Garnet’, an enhanced VGA digicam and – finally – Bluetooth. The handset includes useful quad-band GSM/GPRS connectivity for voice and data, with the bundled VersaMail email application supporting a single Microsoft Exchange Server 2003 ActiveSync account and multiple IMAP and POP accounts. Anyone who’s ever battled with the complexities of hooking up email services on a mobile will appreciate the mass of preloaded server settings for local ISPs and other email providers built into the Treo. So long as your ISP is listed, setting up a new account takes a matter of seconds. One thing noticeable by its absence was WiFi. 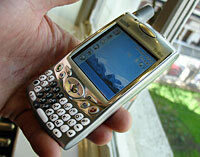 Although palmOne offers an optional WiFi SDIO card for some of its Tungsten PDAs, it currently doesn’t work with the Treo 650. 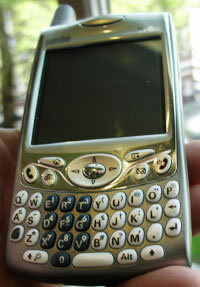 I asked François Bornibus, vice president for palmOne EMEA, about this oversight, and was told that “drivers were being written” for the Treo, although he couldn’t give me a definite release date. He also said that a Treo with a fully integrated WiFi “was on the roadmap”, although he wasn’t mindful of giving me a peek at this map. Even with WiFi, Treo users will still be missing out on the killer VoIP application, Skype, so I asked if there were any plans to introduce a version for the Palm platform. With a Gallic shrug, Bornibus suggested that it would be up to Skype themselves. Finally, I told Bornibus about the countless rumours of a windows-based Treo (sometimes called the Treo 670) that had been circulating around the Internet and asked him if there was such a device in the pipeline. With an enigmatic smile, he answered, “Anything is possible” – make what you will of that! Despite attending an official product launch, I left none the wiser as to when the Treo will actually be available or what other network carriers (apart from Orange) will be offering the phone. Naturally, there wasn’t a peep about pricing plans either. Despite the somewhat UK shambolic release timetable, reviews across the Atlantic have generally been very enthusiastic, and as soon as we finally get our grubby mitts on a Treo, we’ll be posting up a full review.